International law does not specifically prohibit states imposition of capital punishment, but its restriction is arranged by Article 6(2) of the International Covenant on Civil and Political Rights. The article specifically states that “[…] death sentence may be imposed only for the most serious crimes by the law in force.” According to a report produced by Harm Reduction International under a grant from the European Commission, from 2000 onwards more states have revoked capital punishment for all crimes, and others have eradicated the sentence as a possible punishment for drugs. This is partly because there is a rising argument that capital punishment for drugs is a violation of international human rights law. Whereas abolitionist norms have become a global trend, the death penalty, especially on drugs trafficking case, is still practiced in Southeast Asia nations: Indonesia, Singapore, Malaysia, Vietnam and Philippine. 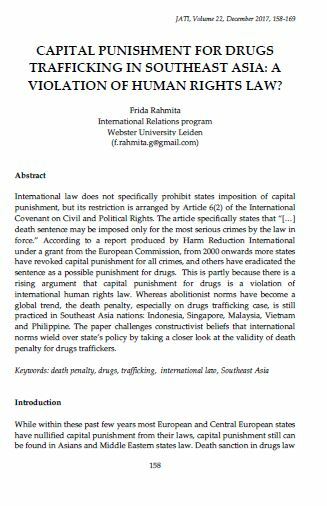 The paper challenges constructivist beliefs that international norms wield over state’s policy by taking a closer look at the validity of death penalty for drugs traffickers. RAHMITA, Frida. CAPITAL PUNISHMENT FOR DRUGS TRAFFICKING IN SOUTHEAST ASIA: A VIOLATION OF HUMAN RIGHTS LAW?. JATI - JOURNAL OF SOUTHEAST ASIAN STUDIES, [S.l. ], v. 22, n. 1, p. 158-169, dec. 2017. ISSN 2600-8653. Available at: <https://jati.um.edu.my/article/view/10252>. Date accessed: 26 apr. 2019. doi: https://doi.org/10.22452/jati.vol22no1.11.